Best riding lawn mowers 2019 that we introduce in this article is an expensive machine with a price usually higher than $1000. Besides that, the mechanism of the riding lawn mower is more complicated than a push mower or a self-propelled lawn mower. That is the reason why when choosing a riding lawn mower, you may have to spend a lot of time and effort. 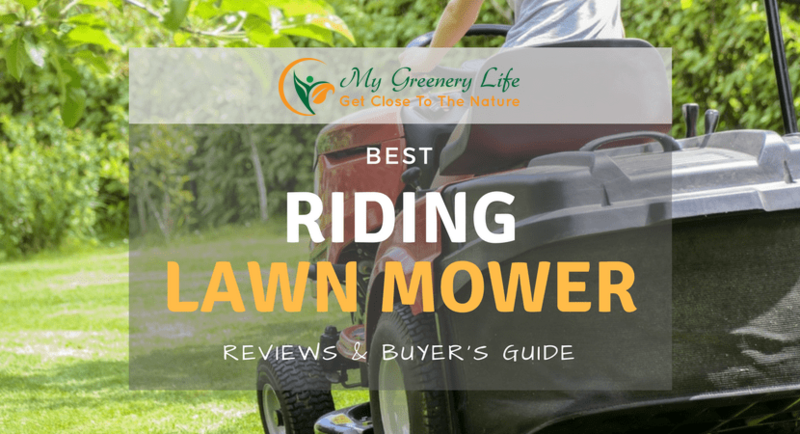 I understand your troubles, and that is the reason why I decided to write this article – “Best Riding Lawn Mowers 2019: Buying Guide And Reviews”. In this article, I would like to introduce some useful information about the riding lawn mower, how to choose a good riding lawn mower, as well as recommend the best selling model of the riding lawn mower on Amazon. I hope that the information in this article will help your shopping become much easier. Why Should We Buy Best Riding Lawn Mowers 2019? A riding mower is a big and powerful lawn mower. It looks like a car, and you can ride on it. It is equipped with a horizontal rotating blade system for cutting grass surfaces to an even height. The cutting deck of it is mounted into the middle of the mower between the front and rear axles. This type of mower is usually used to mow large lawns. Some types of riding lawn mowers are called g﻿﻿arde﻿﻿n﻿ tractors because of their design which resembles an agricultural tractor. 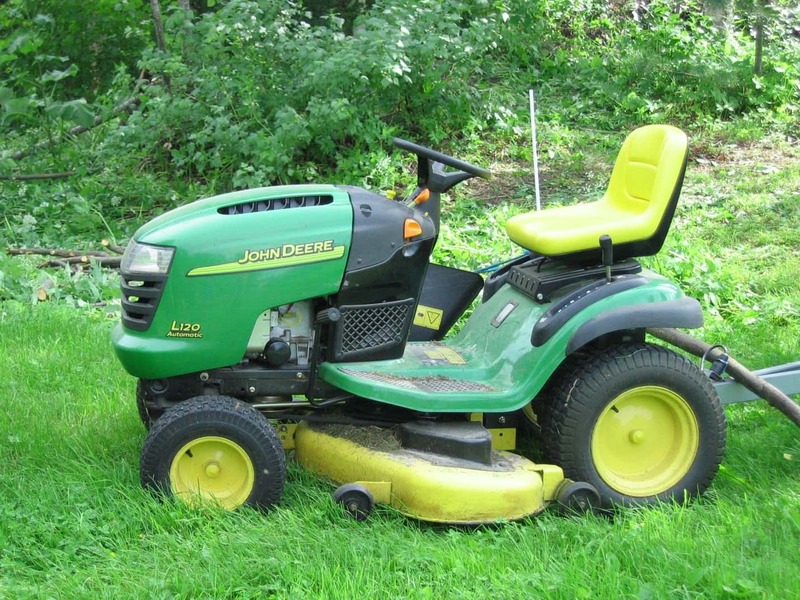 A riding lawn mower is powered by a gas or electric engine, which provides the movement to both the blades and wheels. The driver sits on top of the mower and controls the speed and direction of it. The driver can drive this machine forward or backward and turn left or turn right in order to cut the grass as precisely as possible and avoid obstacles. While driving over stones or complicated terrain, he or she can turn off the blade and then easily pass through it. Some riding mowers might have pedals which enable braking and accelerating control. For manipulating steering and throttling, these machines are designed with steering wheel and levers. Riding lawn mowers are equipped with rotating blades beneath a protective deck. These blades cut the tops of the grass while they are spinning at high speed. The protective deck works as a shield against the rock or other obstacles, therefore avoiding the unexpected injuries or damages. Moreover, this deck also prevents grass clippings from shooting out. It is true that a riding lawn mower is much more expensive than a push mower. However, if you own a yard or garden that is half an acre or more in size and a push mower cannot mow it effectively, then you should consider buying a riding lawn mower since it was invented to save your time and effort significantly. Since riding mowers often mount other devices for multiple gardening purposes, you might get the best experience using them. They are not only a simple cutting grass machine, but they also can be used for spreading grass seeds, fertilizing, hauling feed for your livestock, or even pulling the snow blows in winter. Some riding lawn mowers can be attached by a leaf collecting device including grinding and turning leaves into manure. 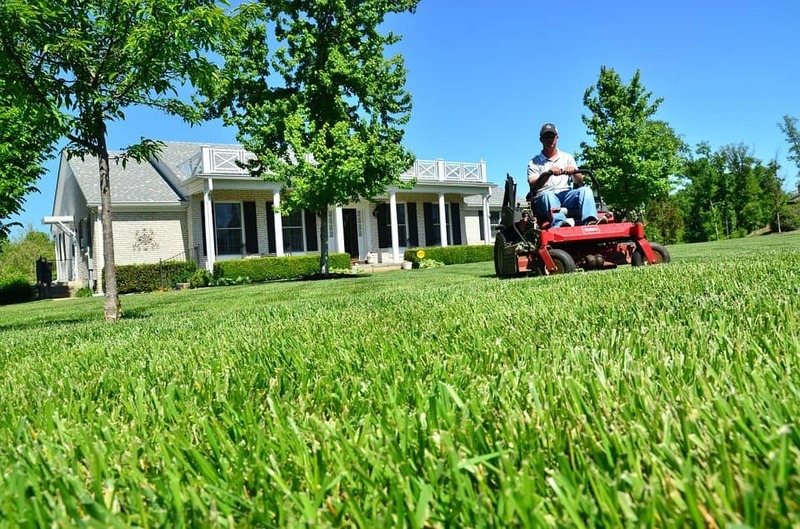 There are other advantages of a riding lawn mower compared with a push mower such as the fuel capacity of a riding lawn mower being bigger than a push mower. It will allow you to mow a large area with less refill time. Besides that, the spare parts of the riding mowers are much more available than the spare parts of the push mowers. If you have any broken part during use, you can replace it fast and easy. Currently, there are many models of riding mowers you can choose on the market. The big question is: “how can you select the suitable riding lawn mower for yourself?” Here are some criteria of good riding lawn mowers you should keep in mind before going shopping. 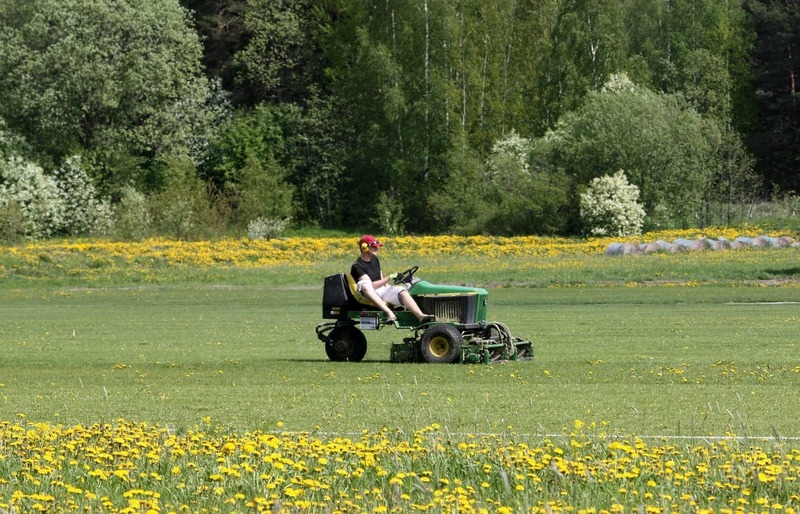 This is one of the most important things you should consider when shopping for a riding mower. Generally, if your yard is large and mostly open, it is better that your riding lawn mower has a large cutting width. The cutting widths can range from at least 28 inches to 60 inches. However, if there are lots of obstacles such as trees, bushes, water fountains, bird baths, flower beds, etc., then you should choose a riding mower that is small enough to go through tight passages. Another tip for you to choose a good riding mower is about the turning radius. The turning radius of riding mowers tolerates from 4 inches to 28 inches. Again, if your garden is full of obstacles, a small turning radius will be very helpful. A zero turn mower might be your best choice in this case since they can easily maneuver around shrubs, trees, lawn furniture and so on. However, a zero turn lawn mower also has a weakness. It’s difficult to work with a zero turn lawn mower on hills as it tends to turn too sharply on steep terrain. First, please keep in mind that the “engine horsepower” determines the mowing speed and how fast the blades can turn. The engine power can range from 12 to 25, and a riding lawn mower with 20 horsepower would be a sufficient machine for an average homeowner. Beside that, when shopping for a riding mower, you should not only focus on the engine power, but you should also focus on the cooling system, the oil filtering system, the air filter, and the engine type (single cylinder or twin cylinder). If the engine has a good cooling system, this can keep the engine temperature low and help to extend the engine life. Besides that, the oil filtering system helps to improve the period between changing oil twice. A good air filter can protect your engine from the dirt effectively, and the twin cylinders provide more power to your lawn mowers. They are also suitable for large yards, while the single cylinder engines are recommended for yards smaller than an acre. An automatic transmission can help you control the speed of your mower easily without using a clutch or changing gears. The automatic transmissions are very helpful, especially when there are many obstacles in your garden. In fact, you can speed up, slow down or reverse effortlessly. 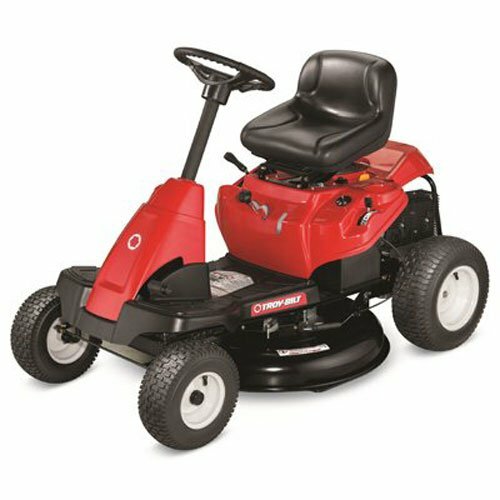 After introducing the criteria of a good riding lawn mower, I would like to recommend a best selling model of riding lawn mower on the Amazon website so that you can easily assess it by using these criteria and make the decision whether it is a suitable riding lawn mower for yourself or not. “Troy-Bilt 420cc OHV 30-inch Premium Neighborhood Riding Lawn Mower” is the best selling model among the riding lawn mowers on Amazon. With over 150 customer reviews and the rating around 4 stars, we can easily see that this riding lawn mower has a high attraction and gets a good assessment from the customers. Compared with other models, we can recognize that it is an outstanding product since the other models have much less customer reviews and ratings. That is the reason why I would like to review this riding lawn mower. In this article, we will deeply analyze the advantages of this riding lawn mower and find out whether it is a suitable riding lawn mower for you or not. First, I would like to say that the engine is the highlight of this riding lawn mower. It is equipped the powerful 420cc single Troy-Bilt engine which has the speed up to 4.25 MPH. With this engine, the mowing efficiency will be significantly improved; therefore, this riding lawn mower is especially suitable for a mid-sized or large sized yard. Beside that, you can easily adjust the mowing speed with the 6-speed transmission system. With this system, you can flexibly choose the suitable mowing speed for yourself and feel more comfortable when mowing with this machine. The compact design, with a 30-inch cutting deck and the 18-inch turning radius feature of this riding lawn mower, helps us maneuver it easily in narrow areas. On the other hand, this riding lawn mower is especially suitable for someone who has small storage space because the compact design of it is a good solution for space-saving. One more advantage of the cutting deck I would like to mention is the adjustable cutting height feature. This feature gives you five options of cutting height, and you can adjust between them easily. Finally, the manual take-off system will make you feel more comfortable when mowing with this machine since you can easily engage the cutting blade whenever you want. Besides the advanced features, “Troy-Bilt 420cc OHV 30-Inch Premium Neighborhood Riding Lawn Mower” also brings the comfortability and the convenience to their users. With the special design, including a mid-back seat and a soft grip wheel, you can comfortably ride on it for a long time without getting tired. The last advantage of this riding lawn mower is the durability of it. The wheels of this riding lawn mower were made by special treatment rubber, so they were built to last for a long time. Along with the durable 420cc single Troy-Bilt engine, they will provide their users with a reliable performance. The manufacturer also shows their commitment to the quality of this product by the two year warranty program. So, if you choose this machine, I think you may have nothing to be concerned about with the quality of it. You can click here for more riding lawn mower reviews. After r﻿﻿ead﻿﻿ing ﻿﻿﻿﻿this article – “Best Riding Lawn Mowers 2019: Buying Guide And Reviews”, you may deeply understand the basic knowledge of a riding lawn mower, as well as the way to choose a best riding lawn mower for yourself. Besides that, I have already recommended an outstanding riding lawn mower: the “Troy-Bilt 420cc OHV 30-inch Premium Neighborhood Riding Lawn Mower”. You can assess this model of riding lawn mower easily by comparing the advantages of it with the criteria of a good riding lawn mower. In my opinion, I think that it is worth a try. You can check more information about this riding lawn mower by visiting the Amazon website. I hope that you can find a suitable riding lawn mower for yourself. Thanks for reading! I love gardening, and I can spend all of my free time taking care of my garden and discuss about gardening experiences with my friends, who have the same hobby as me. That is the reason why I would like to create My Greenery Life as a useful blog about gardening and lawn care.